home / Tagged "Cultural Tour"
When your cruise ship docks at the Port of Dubai, head out to discover the Dubai desert with a private driver/guide! The exciting 5-hour shore excursion includes transport by 4x4 vehicle, a camel ride, sandboarding session and a visit to a desert campsite. Get a henna tattoo if you wish, and then feast on barbeque dinner while watching two shows: a ‘tanoura’ folk dance plus a belly-dancing display. Enjoy a visit to capital city of the United Arab Emirates and see historical attractions and traditional sides of the vibrant city. Explore DubaiÂ’s fascinating heritage in the Al Fahidi Historical Neighbourhood, the Dubai Museum, the Creek and the Gold and Spice Souks. Explore the Dubai Museum to learn about times gone by, and cross the Dubai Creek in a traditional Abra. Discover the major tourist attractions, latest sites and upcoming developments of Dubai in the company of a professional licensed English-speaking tour guide. 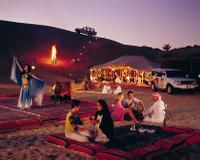 Dubai is an ever changing city and new tourist sites are always being added to the program. This 5-hour guided tour includes museum entrance, a shared boat ride and transportation in a luxury car or SUV from hotels in Dubai or the sea port.